Canvas Printing - Fast, Quality Printing at 24 Hour Print! A canvas serves as the sturdier and easiest way to display art works or photographs to look more sophisticated. No wonder more and more people are now hooked to canvas prints. Commonly used for personal use, canvas prints are normally seen as home or office décor. Wherein the featured art work may range from a reproduction or copy of a well-known art, or from the owner’s collection of self-created and produced photographs, drawings, or painting. 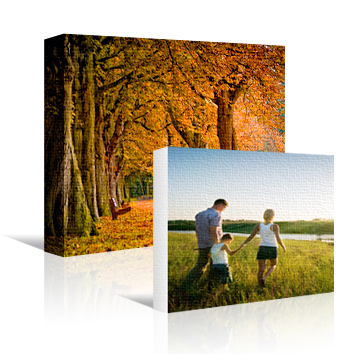 24 Hour Print’s canvas printing service is available in sizes from 11” x 14” to 24” x 16”. You can also choose between rolled or stretched canvases. Stretched canvases are ideal for gallery or museum display and as personal home décor. On the other hand, rolled canvases are ideal for selling copies of art work and other personal works, such as photographs or drawings. Apart from the size and presentation options, you can also choose between gallery and museum wraps. These two are considered when you plan to use a stretched canvas for display purposes. Gallery wraps has the image or artwork printed on the canvas up to the sides. While a museum wrap, the artwork is printed on the front, flat side of the canvas. Museum wraps are commonly used along with a frame, while a gallery wrap can be displayed without a frame. Call us at 1-844-380-7056 or launch our Live Chat support in case you’ve got questions or need assistance with printing your art work on canvas.